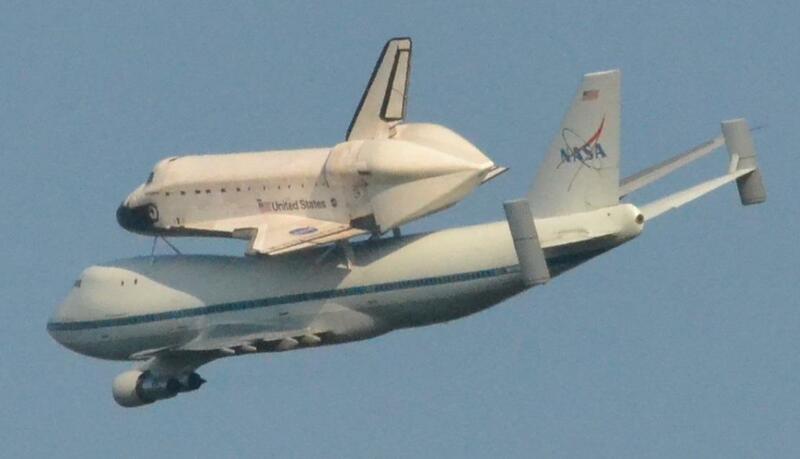 Space Shuttle Endeavor (OV-105) is on the way to her new job at the California Science Center. She is scheduled to arrive at LAX on Friday after completing a flyover of several landmarks, including The Griffith Park Observatory and Disneyland (Disneyland?). I’m conflicted over whether I should drive to Griffith Park or, perhaps, to Malibu – where she is also scheduled to fly over. Parking could be a real pain. As a young man I used to go to LAX, park in the lot of the Proud Bird Restaurant, and walk down Aviation Blvd. to the East end of the runway. I could stand there and watch the planes come in for a landing, at times only a hundred feet or so over my head. It was exhilarating. Maybe I’ll do that. I spent nearly half of my adult life working on the Space Shuttle Main Engine (SSME) program at Rocketdyne in Canoga Park, California. I grew up in the San Fernando Valley and have vivid memories of the many rocket engine tests that took place in the Santa Susana Mountains to the West of where I lived. I would go outside and could hear the roar and see the sky lit up. Those engines helped take us to the Moon. It was magical. I came to Rocketdyne quite by accident and, even after I started as a temp (what they called a “Job Shopper”) working on the return to flight efforts after the Challenger disaster, it took a while for me to realize I could work there. Not being an Engineer, it somehow never crossed my mind that I could find a place in the organization. I ended up spending 21 years there – in a 23 year period (taking two years off in an ill-fated attempt to return to a family business) – working primarily on the SSME program. Endeavour was the replacement vehicle for Challenger, so I am somewhat emotionally tied to her. Half my working life! In 2010, I accepted an offer of early retirement, which was made to those of us who were sixty years of age or over because the Shuttle Program was coming to an end. It wasn’t quite over, and I had always joked that I would be the one to turn the lights out at the end. I expected to work until I dropped dead, maybe around 80. It didn’t work out that way. I still miss being a part of the space program and seeing Endeavour on her last flight is dredging up a flood of emotion I’m not sure I’m prepared to handle. Thankfully, she’ll be very close by and I can take my two girls to see her. Fare thee well, Endeavour. I am eternally thankful I was able to play a small role in your voyages. I wish you well on this, your final mission.